When reusing modules between projects, I often include a few abstract entities that I can inherit from in my projects. What I would like to be able to do is to ensure this doesn't happen. Either by manually specifying a class to be a mapped superclass instead of an entity, or by excluding a bundle from being exported entirely. If either of these are currently possible, I'm unaware how. 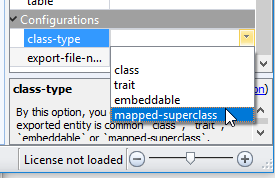 new feature to explicitly mark the entity as MappedSuperclass is introduced in the latest beta.